The Kula Path describes the journey from RYT200 Yoga Teacher to a conscious facilitator, with many places to pause along the way. Within each of us lies a guru, a wise one who knows the truth behind each of our thoughts, words, and actions, an ancient soul that sees through to the essence of all things and knows all there is to be known. The Kula Path is designed to help you reach your potential by providing you with tools and experiential training to deepen your skill set as a facilitation and spiritual leader. Whether you plan to host retreats, transformational programs of your own or have the intention to lead yoga teacher trainings, this path supports your journey as you step into the role of a conscious facilitator. We are dedicated to supporting our Kulitas expand and grow to the best of their abilities within our family. Giving you the tools and language you need to share the spiritual practice of yoga and empowering you to trust in the channel of truth you carry. The process of the Kula Path is to help evolve participants’ natural leadership and space-holding skills into a holistic awareness of the needs of their particular class or workshop, developing them into high-level, conscious Facilitators. You will be encouraged along every step of the Kula Path to embody your own power, share your light and allow your magnificent gifts to emerge. *If you completed your 300hr with another school, please reach out to us and inquire about your options. Following each step of the path, there will be an evaluation with the Facilitators based on Pathitas progress and performance. We are here to support you on your journey becoming a facilitator of Yoga and Holistic Health. Completing this path, does not guarantee you a position with Kula Collective. Kula is committed to supporting your growth as a facilitator. With the experience and skills gained along the Kula Path, we hope to empower you to create classes, workshops and retreats that inspire your passion and purpose. Please direct any questions to admin@thekulacollective.com. The Kula Collective Facilitation Intensive is designed to open participants to the nuances of group facilitation, including pedagogy, mediation, problem solving, creative workshops and energetic space-holding. The purpose of this training is to help evolve participants’ natural teaching and space-holding skills into a holistic awareness of the needs of their particular class or workshop, developing them into high-level, conscious Facilitators. 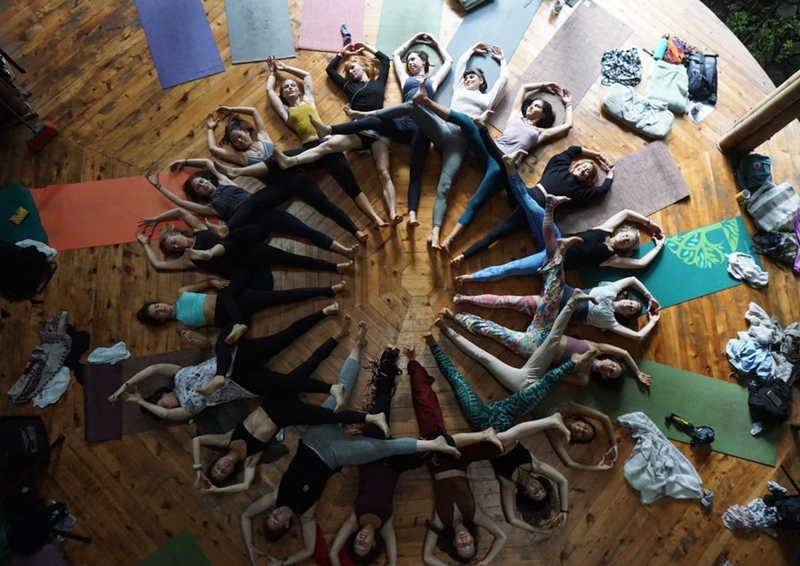 The Facilitation Intensive uses the facilitation of a YTT or yoga workshop as an example, offering skills and tools applicable to facilitating in a variety of contexts. This is an opportunity to learn through experience, stepping into a role alongside our passionate and talented Facilitator team. Typically, the first apprenticeship will be a watching and learning mostly as a ‘shadow’ role. The roles that the apprentice takes on within the first apprenticeship can vary depending on the Facilitation Team and your current experience. The apprentice is encouraged to participate in sharing the Kula Basic Flow and other classes that highlight their specialties and passion. For the first training, apprentice's are asked to be present during the entirety of an RYT200 training, including Facilitator meetings. We will send the 200hr manual in pdf form, and apprentice’s will arrive prepared with pre-readings and familiarity with the curriculum that the Lead Facilitator requires. During the training, we invite you to share your insight wherever possible, and to commit to maintaining the energetic space at the highest vibration possible. The goal of the first apprenticeship is to be in a “mentorship role” and a liason between the students and the facilitation team. First apprentices are only asked to cover their Room & Board for the duration of the training. Upon the completion of the first apprenticeship, the apprentice may be invited to assist in a second offering as a Support Facilitator. In this second experience, the support facilitator will be encouraged to share classes and workshops in all aspects of the training, especially those aspects that were not shared in their first apprenticeship experience. The Support Facilitator is focused on gaining the experience to step into a co-facilitator role.